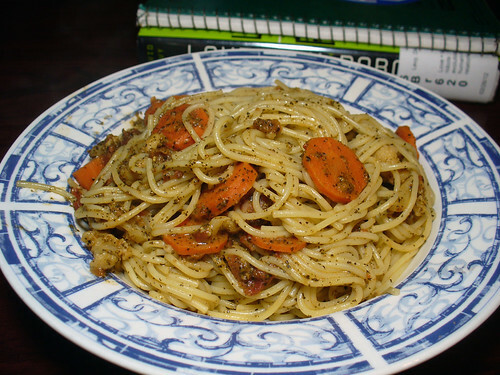 What do you do with leftover Basil Pesto? Toss it on some pasta and veggies, of course! Made with pine nuts, basil, garlic, nutritional yeast, and olive oil, it’s a relatively healthy way to add some variety to an otherwise plain old pasta dish. Gold also includes variations for Sun-Dried Tomato Pesto and Cilantro Peso, both of which I hope to try in the future. Breakfast for dinner! (Seriously, who’s awake enough in the morning to make pancakes and syrup from scratch? Not this vegan!) 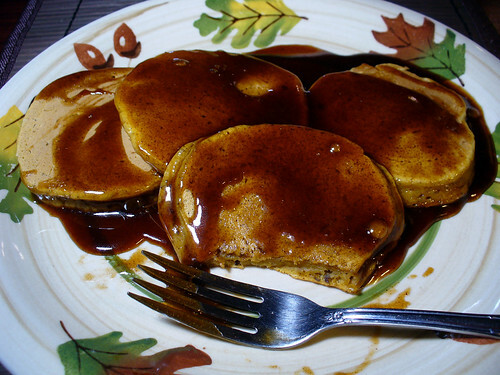 These pancakes are delish, though I’m still a little partial to Bisquick’s batter (I know, boo hiss boo!) – it’s somehow lighter and fluffier than any other pancakes I’ve ever tasted. 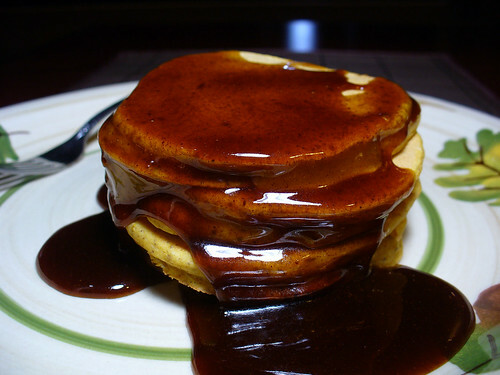 The syrup is yummy too, but here’s a little tip: don’t start making it until the pancakes are done cooking, or nearly so – cook the syrup too long (in my case, as long as it takes to make the pancakes), and it’ll be too thick to pour, let alone easily eat. Seriously, it was more viscous than molasses! The more you know. Rather than try to use the leftover Cinnamon Syrup as a – ahem! – syrup, I tossed it in the food processor with a few frozen bananas and – voila! 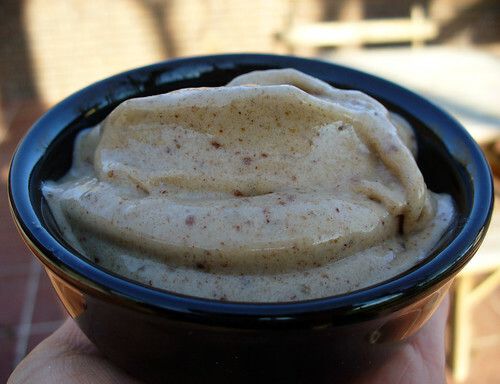 – Sweet Cinnamon Banana Ice Cream! This was so ridiculously good that I’m seriously considering messing up another batch of Cinnamon Syrup just so I can make more ice cream. I’m a huge fan of banana ice cream, and this is quite possibly my new favorite flavor. If this casserole taught me anything, it’s that I like onions – but only in moderation. Having never tasted French Onion Soup before (I’m allergic to milk, so many of these dishes were entirely new to me! 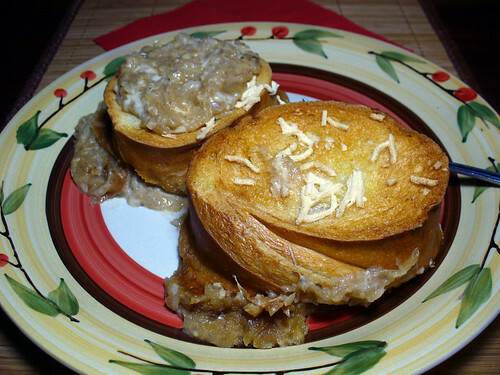 ), I wasn’t sure what to expect of this French Onion Soup Casserole. In a word, it’s very onion-y. The recipe calls for one-two-three-FOUR onions, yo! THAT’S QUITE A FEW ONIONS FOR ONE CASSEROLE! All in all, I liked the dish – but once the bread was gone, I still had a significant amount of the onion layer left over. Shane, who proved a bigger fan, used it as a topping on his Boca chicken patties, so it didn’t go to waste. I might try a modified version of this dish in the future – half the onions, perhaps followed by a layer of mixed veggies to take the edge off? Or half the onions, twice the bread? (Cubed, even, so I can cram more of it into the baking dish?) We’ll see. But if you heart French Onion Soup, this just might be the casserole for you! 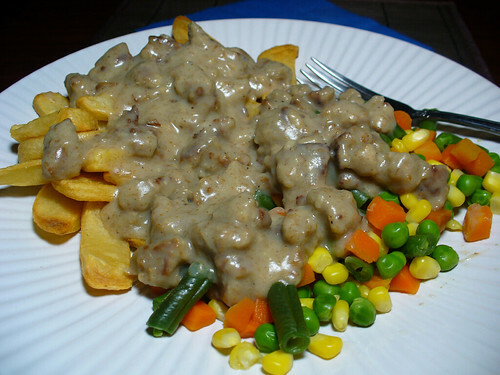 Vegan Junk Food pairs this gravy with Scrambled Tofu and Biscuits, but I just dumped it atop a plate of steak fries and microwaved mixed veggies. In-freaking-credible! Definitely one of the highlights of the book, this recipe has already joined my regular rotation. I’m going to have to start buying Lightlife’s Gimme Lean Sausage by the case! 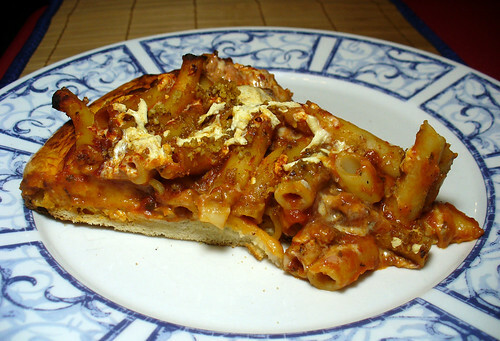 This pizza is a work of art – and, not surprisingly, is rather labor-intensive. Shane made it for me one Saturday night, and it took him nearly an hour just to bread and fry the eggplant! Still, it’s so worth it, especially if – like us – you usually stick to simple cheese and pepperoni pizzas. Treat yourself! 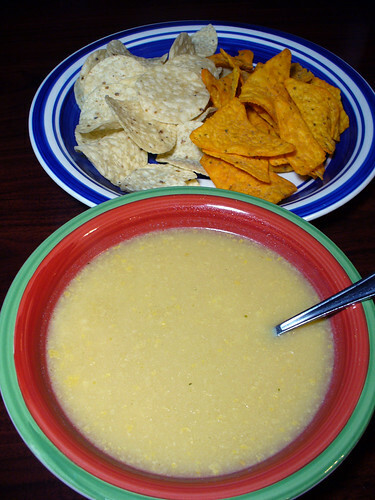 It’s fast, it’s soup – and it’s an excellent excuse to gorge oneself on tortilla chips! Just make sure you have instant rice on hand, otherwise this fast soup isn’t so quick to cook. ‘Nuff said. 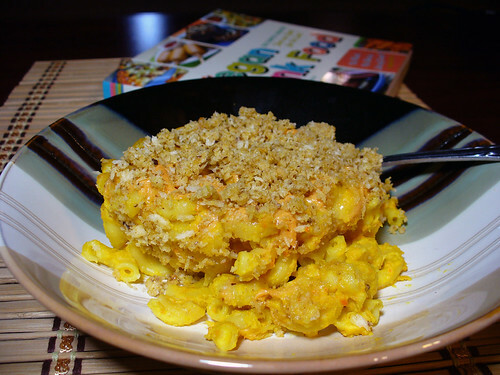 I already raved about Gold’s Mac and Cheese Bake earlier in the review. While this is a little more time-intensive to make than some other mac & cheese dishes, it’s one of the yummier recipes I’ve tried – and it’s also somewhat healthy, as far as mac n’ cheese goes. Oven-baked mac and cheese dishes tend to dry out, but here the Cheese Sauce stays moist and creamy. I still like mine better, though! 4 1/2 stars! This is the vegan french toast recipe I’ve been waiting for! (Those banana batters just don’t do it for me.) 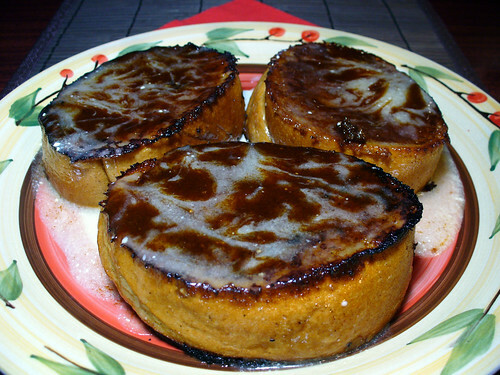 Delicious and fairly easy to make, and topped with a cinnamon glaze AND a vanilla icing. YUM. This one gets ALL the stars! Tip: If you’re running low on time, skip the glaze and icing and just make the french toast. It’s also good with plain old maple syrup! Carbs, meet carbs! Minus the vegan ricotta, which we were too lazy to make! Super-yummy and probably easier to make than my own version. But eating it? Every bit as messy! Next time I think I’ll try it with a more bite-sized pasta; elbows, maybe? The Almond Joy Bar Cake is the first and only dessert I’ve tried from Vegan Junk Food. It’s not that I have anything against sweets – for from it! – but I started my Invisalign treatment not long after receiving this book, and the trays are difficult enough to remove that my days of casual snacking have come to an end. Or rather, are on a one-year hiatus. Le sigh. And so it was with great excitement and eager anticipation that I tried this one sweet treat. Sadly, I ran into problems from the start. 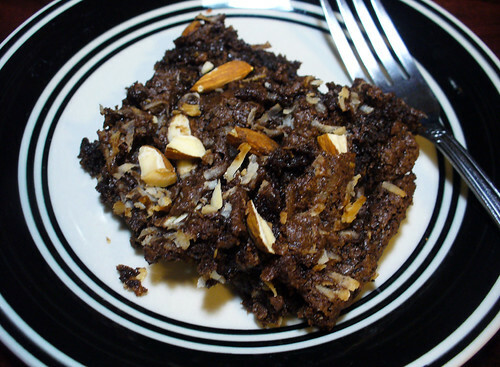 The bar consists of three layers: 1/2 the chocolate batter, followed by almonds and coconut shreds, followed by the rest of the batter and some almond slivers to garnish. Gold instructs you to “pour” the batter into the pan; the thing is, the batter’s much too thick and viscous for anything but spreading! This wasn’t a problem until I reached the third layer: since I couldn’t spread the batter on top of the loose ingredients without disturbing them, everything just got jumbled together (as you can see in the photo). Still, I’m not fussy; a messy dessert is just as yummy. AND THEN THE CAKE STUCK TO THE BOTTOM OF THE PAN. Now, as I mentioned before, my track record with baked goods isn’t so hot, my main problem being pan stickage. Still, I went through the recipe multiple times and couldn’t see where I went wrong. Usually I blame myself in cases of massive recipe FAIL – me being the amateur and all – but I don’t know what I did wrong, if anything. But wait! This story has a happy ending! The bars tasted much better the next morning and, even though they were a mess of crumbs and jagged pieces, I still enjoyed the entire pan…. …both on its own and in a batch of banana ice cream! 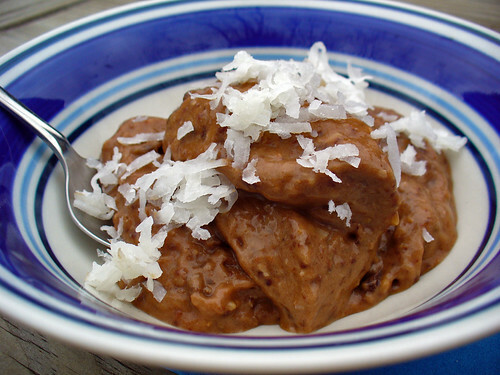 It just so happened that I had a few more frozen bananas to use up, so I blended them – along with some cocoa powder, almonds, and shredded coconut – in a food processor until smooth, and then added the remaining Almond Joy Bar Cake (about 1/8 of the pan) for good measure. Dare I say that the ice cream tasted even better than the bars? I DARE! Linguine Alfredo, where have you been all my life? I will be eating you again, dear friend. Until next time. 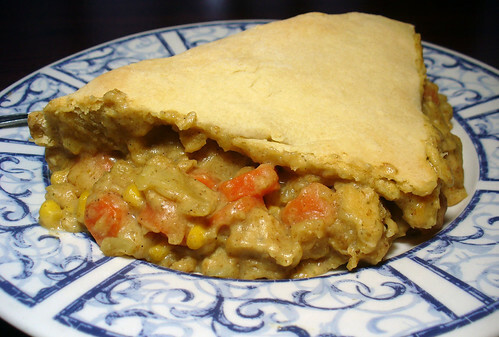 KFC’s recent retro ’70s chicken pot pie commercials left me craving a Tofurky pot pie. Enter Lane Gold. Stuffed with carrots, celery, potatoes, vegan chicken patties, and a savory gravy sauce (nutritional yeast, I’m a convert! ), this is one filling meal. Two, actually: we had enough for leftovers! It may not be as pretty as KFC’s pies, but I bet it’s every bit as delish. Also, animal-free. Score! The “bacon” is tasty, though I don’t think it tastes very much like bacon (or even the processed vegan versions). I can’t see downing an entire platter in one sitting, but it does make for a nice garnish on sandwiches and pizzas and such. I also set out to make the Kale Chips, but accidentally bought cabbage instead of kale. (Hey, the bins were mislabeled!) File this one under “vegan problems.” The seasoning was tasty, at least! Another huge win! This is saying something, since I’m not normally tofu’s biggest fan. This casserole layers blended and seasoned tofu (Firm tofu! And here I thought that only silken tofu would blend so smoothly! Imagine that!) with fried Lightlife Gimme Lean Sausage and tater tots. 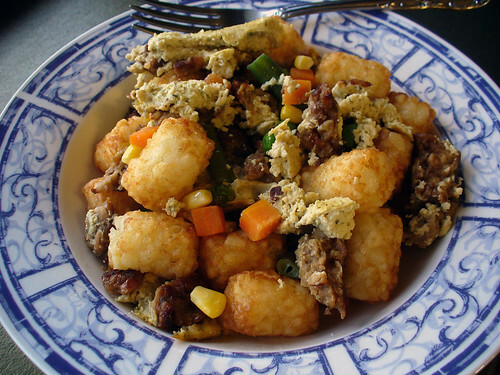 All your favorite breakfast foods in one dish! I was especially impressed with the tofu; with the nooch, chives, and garlic, to add flavor, it really has the taste and texture of scrambled eggs, or an omelet. Makes me wonder what else my fussy, stubborn self has been missing out on all these years! 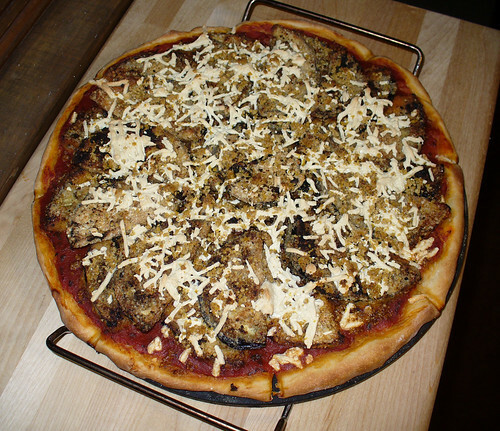 Hummus is the yummiest – and this Pizza Hummus makes for a nice change of pace! 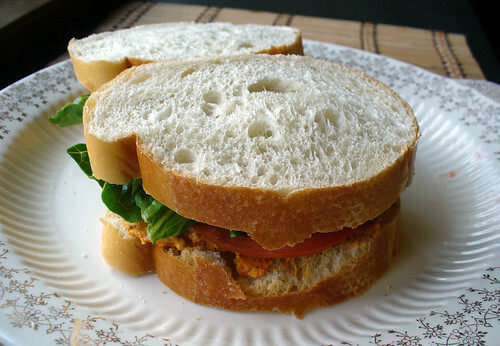 Gold recommends using it as a dip for french bread, but I just layered mine together with tomatoes and greens to make a sammie. Quick, tasty, and healthy. 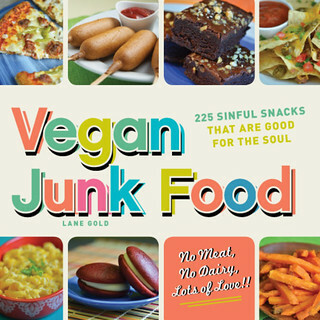 Vegan junk food what now? Parmesan is yet another milky food to which I never afforded much thought in my omnivore days. Prepackaged vegan parms exist, but can be kind of pricey – and so I never bothered to try ’em out. 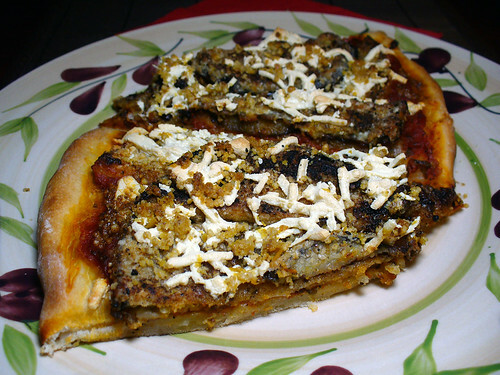 Until Lane Gold introduced me to the diy stuff in her Eggplant Parmesan Pizza recipe. Now I’m hooked! 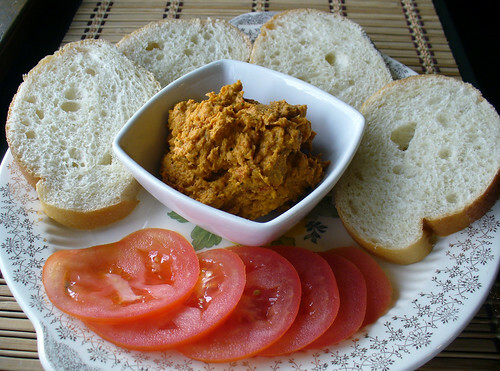 This recipe uses walnuts, nutritional yeast, salt, and olive oil to recreate the texture (and taste? I don’t know!) of Parmesan cheese, but I’ve also seen blends that use other nuts and seeds. Search around online for similar recipes – or check out the ingredients list on a prepackaged blend and start experimenting! 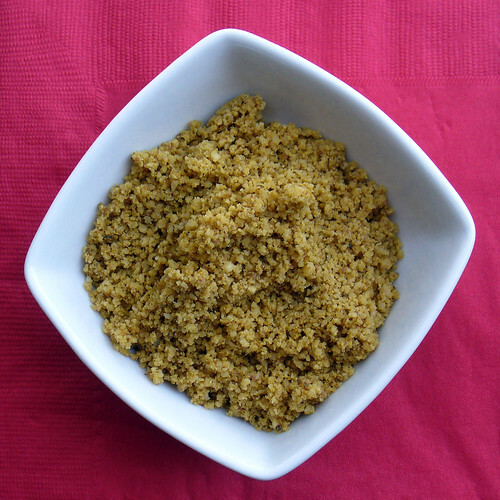 I love this parm so much that I’ve taken to sprinkling it on all my pasta and pizza dishes. 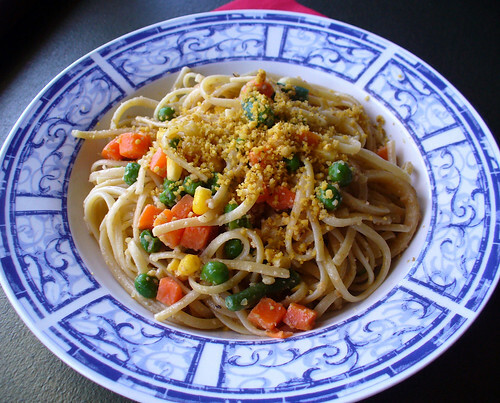 Mix it with a bowl of pasta, veggies, and just a pat of margarine for a quick, tasty meal. 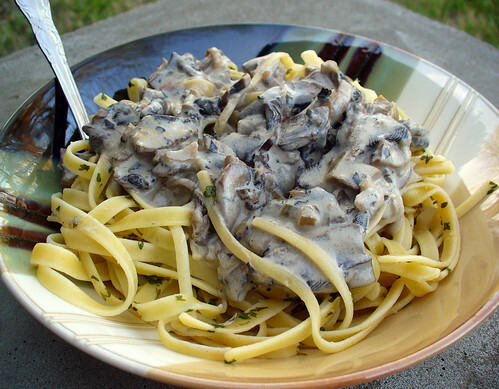 Mushroom Stroganoff: Shroomy! This is another case of less is more. I like the idea of Mushroom Stroganoff, but there are just too many mushrooms in this dish for me! (Mushrooms in Mushroom Stroganoff? Who would’ve thunkit!) 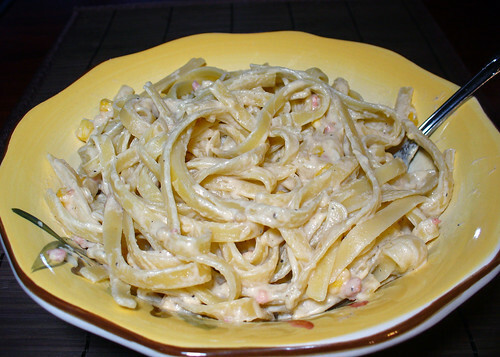 The sauce – similar to that found in the Linguine Alfredo – is quite good, rich and creamy and seasoned not just with the mushrooms, but vegetable broth as well. 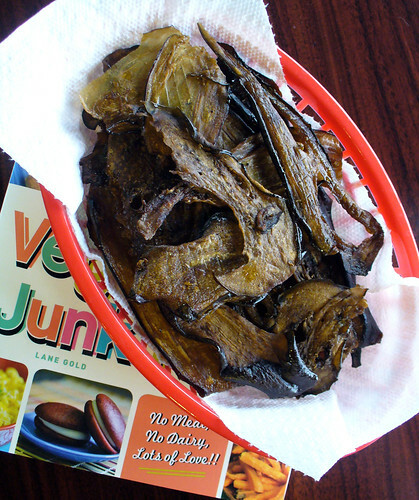 I think I’d like to try mixing this dish up a bit, perhaps by replacing some of the mushrooms with other veggies. Probably it no longer qualifies as “Mushroom Stroganoff” then, hmmm? As always, Shane really enjoyed this dish. Super easy to please, is he. 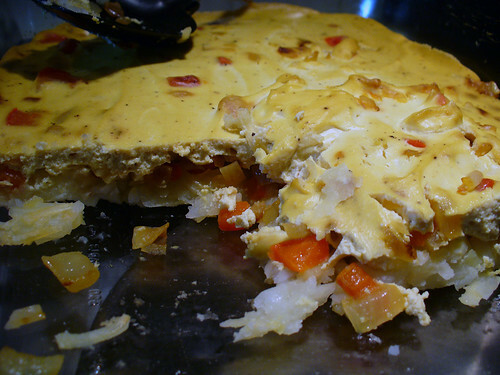 Last but certainly not least, we have a lovely Hash Brown Quiche. (Hint: the hash browns act as the “crust”!) This is kind of like the Tater Tot Casserole, but in reverse: potatoes, followed by the fried onions and red peppers (no sausage this time, sorry! 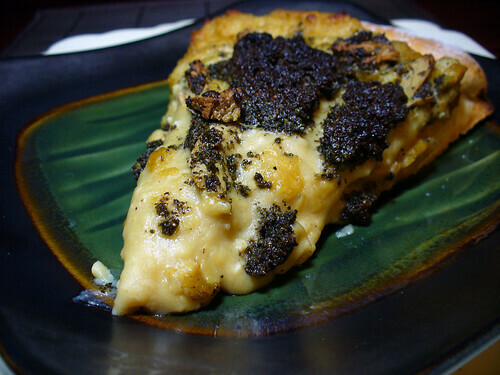 ), and topped with the “egg” (tofu mixed with sour cream and seasonings). Very good, though I encountered the same problem with the blended tofu as I did with the cake batter in the Almond Joy Bar Cake: namely, that it’s not pourable. Probably you could nip this problem in the bud by layering the tofu first (a la the Tot Casserole), but then it’s definitely not a quiche! Who cares, it’s nommy either way. This entry was posted on Thursday, April 5th, 2012 at 10:21 pm. You can follow any responses to this entry through the RSS 2.0 feed. You can leave a response, or trackback from your own site. Thanks for the awesome in-depth review both here and on Amazon! Oh my goodness. Yeah, I really have to order this one, like, now. I love that you actually made so many dishes before writing your review. I’m so annoyed by reviews where they didn’t make any of the recipes, but rave about it just ’cause it looks great!